From the authors of the New York Times bestselling Forks Over Knives Plan comes a complete guide to a whole-food, plant-based lifestyle for your entire family, with more than 125 delicious kid-friendly recipes and tips for raising a whole-foods-loving child in a junk-food-laden world. After the trailblazing film Forks Over Knives helped spark a medical and nutritional revolution, more and more people continue to adopt a whole-food, plant-based lifestyle. Now, Doctors Alona Pulde and Matthew Lederman share those same values for the entire family. 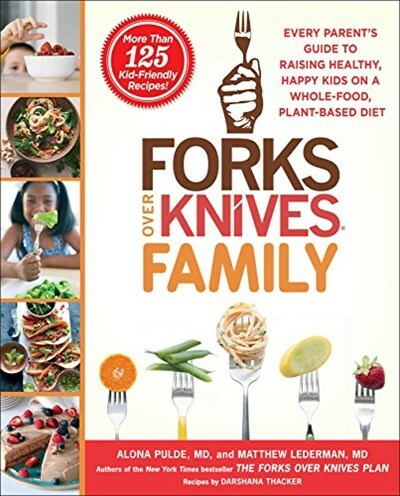 Filled with more than 125 quick and easy recipes, helpful tips, and the latest in scientific findings, The Forks Over Knives Family teaches you why whole food, plant-based eating is the best way to keep your family healthy and well-nourished. With a comprehensive look at every stage of a child’s development, the Forks Over Knives team will help get kids on track to a sustainable, whole foods lifestyle. Beginning with pregnancy, through birth and childhood, and continuing into the teenage years, this guide tackles all the most important topics to keep your children healthy, from dealing with allergies to traveling to sleepovers. The book addresses major obstacles and parenting concerns such as: Are supplements and vitamins necessary? Is my kid eating enough? How can we transition to plant-based living with a house full of kids? What about birthday parties and play dates? With easy-to-understand tips and tricks for a clean, sustainable lifestyle, The Forks Over Knives Family is the in-depth, go-to guide for the whole household to have healthier, more nutritious lives.